In Storyline, result slides allow you to easily communicate to your users about how they performed on any combination of quiz questions you've included in your course. You can report on all questions in your course or, if you prefer, just a subset of questions. Storyline also allows you to use multiple result slides in the same course (although only one result slide can be tracked in Articulate Online or another LMS). You can even combine scores from multiple result slides to create a final result slide with a consolidated score. In this tutorial, we'll look at how to create result slides. Select the Home tab, and click New Slide. Or, select the Insert tab, and click New Slide. Or, in Story View, right-click anywhere in the workspace and choose New Slide. Or, in Normal View, right-click anywhere in the left navigation pane and choose New Slide. 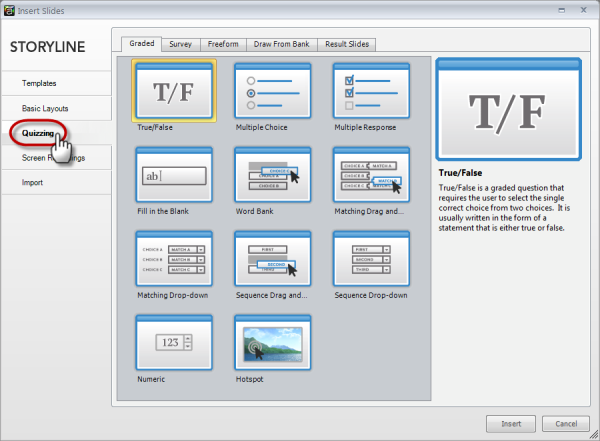 When the Insert Slides window appears, select the Quizzing tab from the left edge. Graded Result Slide: Includes the user’s score, the passing score, and a button that allows users to review the questions. On separate layers of the slide, Storyline also includes a message about whether the user passed or failed. When your users view the result slide, the appropriate layer appears, depending on their score. You can customize the failure and success messages by editing the appropriate slide layer. Survey Result Slide: Includes a button that allows the user to review the questions and a “thank you” message for completing the survey. Blank Result Slide: Includes a button that allows the user to review the questions. The Result Slide Properties window will appear, where you can select the questions you want to track, define the passing score (if applicable), set up a timer, and choose other options for your result slide. Selected Questions: This option allows you to choose the individual question slides or question draws you want Storyline to use when tabulating results. Selected Results Slides: This option allows you to combine more than one result slide into a single cumulative result. 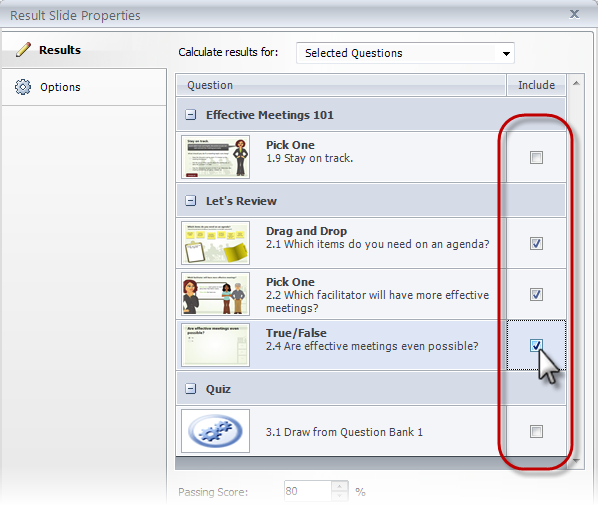 Then use the list box to select either the questions or result slides that you want to track. Simply mark the check boxes next to the slides you want to include in the results. If there are no question slides in your course yet, that's okay — you can still create your result slide now and come back later to choose the slides you want to associate with it. Navigate to the result slide in your project file, click the Edit Result Slide button in the Question panel on the right side of the slide workspace, and then check the boxes for the question you want to add. Or, navigate to a question slide in your project file that you want to add to the result slide, and use the Results Slide drop-down list in the Question panel on the right side of the slide workspace to select the existing result slide. Or, switch to Story View, select all the question slides that you want to associate with the result slide, and then use the Results Slide drop-down in the Slide panel in the lower right corner of the window to select the existing result slide. If you are tracking graded questions, you can adjust the Passing Score field to whatever percentage you like. User must pass each quiz: Each result slide in your course represents a quiz. Select this option if your users must pass each individual quiz to receive an overall passing result. In this scenario, if a user fails any single quiz in the course, then they fail the entire course. Combine points from each quiz: Select this option if you want the scores from the selected result slides to be added together and re-evaluated as a single score. Then assign the appropriate Passing Score percentage. In this scenario, a user could fail one or more of the individual quizzes in the course and still pass the overall course as long as their cumulative score exceeds the passing score assigned here. Tip: When combining multiple result slides into a master result slide, learners will need to visit each of the tracked result slides. Otherwise, the course status will be marked incomplete. Since the timer does not apply to result slides, be sure that the Calculate results for drop-down list at the top of the window is set to Selected Questions. At the bottom of the window, mark the check box next to End quiz after, and then choose the number of minutes you want to allow. Use the Start timer selector to tell Storyline when you want the timer to begin. With first question means the timer starts when users arrive at the first quiz question associated with this result slide. With first slide means the timer starts as soon as users launch your course. Show user's score: If you mark this, Storyline includes a placeholder on your slide that will display both the percentage the learner achieved as well as the number of points they earned. Tip: Storyline uses variables to keep track of the learner’s percentage and points earned. You can use these variables elsewhere in your course if you want, and you can also create variables of your own. Find out more about variables here. Show passing score: If you mark this, Storyline includes a placeholder on your slide that will display both the passing percentage and the number of points required to pass. Allow user to review quiz: This causes a Review Quiz button to appear on your slide, which allows users to go back and review the answers they submitted for the questions. If you also want notations to appear during the review to indicate whether answers were right or wrong, mark the box next to Show correct/incorrect responses when reviewing. Allow user to print results: Mark this box if you want a Print Results button to appear on the slide. If you do this, you can also mark the box that follows, which causes Storyline to prompt the users for a name before printing. If you do that, Storyline will add the user’s name to the header of the printed report. Allow user to retry quiz: Mark this box if you want a Retry Quiz button to appear on the slide, giving users unlimited attempts to take the quiz. Tip: If you want to limit the number of attempts, take a look at this tutorial. How Do I Edit My Result Slide Later? If you need to make changes to your result slide later, you can go to your result slide and edit the content and design directly on the slide. If you need to change other things about the result slide that aren't visible on the slide (such as which questions are being tracked, the passing score, timer, or other options), just click the Edit Result Slide button in the Question panel that appears to the right of the slide workspace. This opens the Result Slide Properties dialog where you can make whatever changes you need. Click the OK button when you're done.